This 1,000 foot roll of yellow caution barricade tape is a necessity for disaster management, emergency response teams and construction projects. 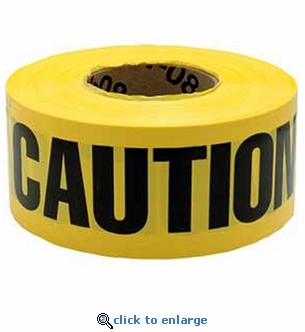 This quality made caution tape is 2 mil thick with black lettering on a bright yellow non-adhesive tape. Prevent accidents by increasing visibility of hazardous areas with this lightweight and economical yellow barricade tape. Perfect for marking dangerous areas around buildings, construction sites, triage areas and more. Length: 1,000 ft. per roll. Yellow with black Caution lettering repeated. Meets OSHA 1910.144 for marking physical hazards.